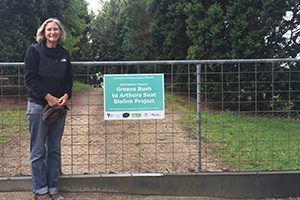 The Greens Bush to Arthurs Seat project has used the warmer spring weather as an opportunity to jump into action and undertake some key actions. The project, being delivered by the Mornington Peninsula Landcare Network, has been working hard to to complete its spring fox control program. The control of introduced predators is an important inclusion to the project, helping to reduce predatory stress and better support populations of indigenous wildlife already under extreme pressure to just survive. More than 16,000 indigenous plants were installed this season and many of the participating landholders have had their ‘Greens Bush to Arthurs Seat Biolink’ participating landholder signage installed in prominent locations, which will help to promote this wonderful project at street level. Nest boxes will soon be installed on a selection of biolink properties that have an absence of hollow-bearing trees to provide valuable habitat for hollow dependent species. Different species have different requirements, so we will be installing a variety of boxes specifically designed to attract a various species including owls, antichinus, sugar gliders and microbats to name a few. Each box will be made from environmentally sensitive EcoPly, incorporating smart designs to deter introduced feral species such as the Common Mynah and introduced bees from taking up residence in the boxes. ‘Greens Bush to Arthurs Seat Biolink’ is an ambitious project being delivered by the Mornington Peninsula Landcare Network and Port Phillip & Westernport CMA that aims to restore indigenous vegetation to strengthen the nature link between two of the Mornington Peninsula’s largest parks – Greens Bush and Arthurs Seat. The project was developed through the vision of local landholders and community members and 20 private properties are a key part of the project, with revegetation works being undertaken on remnant bushland on their properties. This work will help local threatened animals including the Powerful Owl, White-footed Dunnart, Lewin’s Rail and the Swamp Skink, as well as contribute to healthier waterways in the Drum Drum Alloc Creek and Splitters Creek catchments. The project is funded by the Victorian Government’s ‘Our Catchments Our Communities’ initiative. For more information contact Chantal Kelly, Project Coordinator at gb2as@mplandcare.org.au or 0410 764 732.